Description. California myotis are one of the smallest bats in Washington. Fur coloration of the two subspecies found in Washington ranges from rusty to blackish brown and lacks a glossy sheen, with M. c. caurinus having darker fur than M. c. californicus (van Zyll de Jong 1985, Nagorsen and Brigham 1993, Simpson 1993). Ears and flight membranes are black. The ears are relatively short, but nevertheless extend beyond the nose when pressed forward. The tragus is long and narrow. The hind foot is relatively small and less than half the tibia length, and the calcar has a distinct keel. Differences between California myotis and western small-footed myotis are subtle and variable, making identification of the two species difficult when based only on physical characteristics. California myotis tend to have darker fur that is less contrasting with the dark ears and flight membranes, a smaller bare area on the snout, and a more abrupt forehead than western small-footed myotis (Nagorsen and Brigham 1993, Simpson 1993). Rodriguez and Ammerman (2004) reported genetic overlap between the two species. California myotis have an echolocation call with a characteristic frequency of 50 kHz call, whereas western small-footed myotis calls have a characteristic frequency of 40 kHz (O’Farrell et al. 1999b, Gannon et al. 2001). The combination of morphometric and full-spectrum call analyses generally allows accurate field identification. Taxonomy. Four subspecies are recognized (Simmons 2005), with two present in Washington. Myotis c. caurinus occurs in western Washington and Chelan County (Hall 1981), while M. c. californicus is found in the remainder of eastern Washington (Simpson 1993). Distribution. California myotis range southward from southeastern Alaska and southern British Columbia to much of the western U.S., Mexico, and Guatemala (Simpson 1993, Parker et al. 1997; Appendix A). This species is present in all counties in Washington (WDFW WSDM database). Some records from eastern Washington may be erroneous because of past confusion with western small-footed myotis. Population status. Little information is available on population size and trend, although the species is considered common to abundant in some locations and regions, such as western Oregon (Whitaker et al. 1977) and Utah (Oliver 2000). 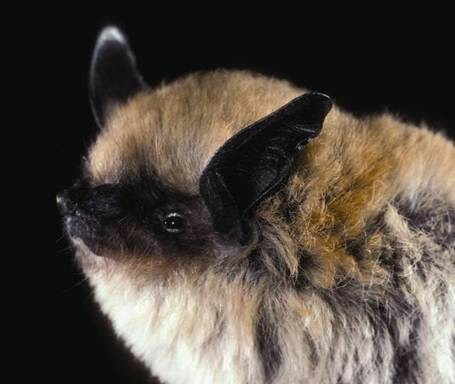 In Washington, detections of California myotis were common or moderately common during acoustic or capture surveys at various sites in the western and eastern Cascades (West et al. 1984, Thomas 1988, Christophersen and Kuntz 2003, Baker and Lacki 2004), the Selkirk Mountains (Campbell 1993), at Badger Gulch in Klickitat County (Fleckenstein 2001a), at Joint Base Lewis-McChord (Wunder et al. 1992, Falxa 2008a), at Woodard Bay in Thurston County (Falxa 2007b), at Long Island in Pacific County (Christy 1993), on the Olympic Peninsula (West et al. 2004), and in the San Juan Islands (Dalquest 1940). The species was uncommon or rare at other locations in the eastern Cascades (Frazier 1997, Taylor 1999), on the Olympic Peninsula (Erickson et al. 1998, Jenkins et al. 1999), at Mt. Rainier (Petterson 2001), at Moses Coulee (Rosier and Rosenberg 2006), and at Hanford (Gitzen et al. 2002, Lindsey et al. 2012). Abundance at Joint Base Lewis-McChord may have declined from 1992 to 2008 (Wunder et al. 1992, Falxa 2008a). Habitat. California myotis inhabit deserts, canyons, shrub-steppe, arid grasslands, and dry interior forests, as well as moister environments such as humid coastal and montane forests comprised of deciduous or coniferous trees, riparian forests, and mountain meadows (Nagorsen and Brigham 1993, Verts and Carraway 1998, Adams 2003). Urban and semi-urban locations are also used (Adams 2003, Falxa 2007a). In arid regions, presence is commonly dependent on the availability of water sources (Johnson and Cassidy 1997, WBWG 2005). Elevations from sea level to 2,750 m are occupied (Nagorsen and Brigham 1993, Oliver 2000). Roosts and roosting behavior. Roost sites include crevices beneath tree bark and rocks; in tree cavities, caves, mines, buildings, and bridges; on shrubs; and on the ground (Nagorsen and Brigham 1993, Wilson and Ruff 1999). Maternity colonies occur in many of these same types of sites. In tree-dwelling populations, reproductive females form relatively small colonies averaging about 10–20 individuals (range = 4–52 bats) (Brigham et al. 1997, Barclay and Brigham 2001, Vonhof and Gwilliam 2007). Females in these populations prefer tall large- diameter roost trees in relatively open patches of forest, with ponderosa pine and Douglas-fir selected preferentially at some locations (Table 3; Brigham et al. 1997, Vonhof and Gwilliam 2007). Females most frequently roost under loose bark in trees or snags in intermediate stages of decay (Brigham et al. 1997, Barclay and Brigham 2001, Vonhof and Gwilliam 2007). Roost trees probably remain suitable for periods of only a few years (Barclay and Brigham 2001). Reproductive females switch roost trees frequently (daily or once every few days) and show low fidelity to individual trees (Brigham et al. 1997). As a result, the number of bats emerging from any individual roost tree often varies considerably from day to day. Distances moved between roosts average about 400 m (range= 6–1,000 m). Males and probably non-reproductive females roost singly or in small groups separate from reproductive females during summer and also change roosts often (Nagorsen and Brigham 1993, Barclay and Brigham 2001). Males occasionally use stumps as day roosts (Waldien et al. 2003). This species appears flexible in its choice of night roosts and may use any natural or human-made shelter (Nagorsen and Brigham 1993). Mines, caves, buildings, tree hollows, rock crevices, bridges, trees, and shrubs are among the structures occupied at night (Barbour and Davis 1969, Hirshfeld et al. 1977, Adam and Hayes 2000). California myotis hibernate alone or in small groups in buildings, caves, and mines (van Zyll de Jong 1985, Perkins et al. 1990, Wilson and Ruff 1999). In Washington, Oregon, and British Columbia, this species commonly hibernates in buildings (Perkins et al. 1990, Nagorsen and Brigham 1993) and has been found in lava tubes (Senger et al. 1974). Winter surveys of more than 650 caves and 70 buildings in these states during the 1980s found single individuals at just two caves in Oregon (Perkins et al. 1990). Both sexes roost together in fall and winter (van Zyll de Jong 1985). In western and eastern Washington and elsewhere, this species emerges from hibernation to become active on both mild and below freezing evenings (Nagorsen and Brigham 1993, Wilson and Ruff 1999, Falxa 2007a; N. Williams, pers. comm.). Reproduction. Descended testes are evident in males by mid-July (Baker and Lacki 2004). Mating occurs in the late fall in most of the range, including the Pacific Northwest (Simpson 1993). Sperm are stored overwinter and fertilization occurs in spring. One young is born annually and births occur from about May to early July in Oregon, Washington, British Columbia, and Alaska (Wunder et al. 1992, Nagorsen and Brigham 1993, Maser 1998, Baker and Lacki 2004, Boland et al. 2009b). Young are able to fly at about one month of age (Wilson and Ruff 1999). Food habits and foraging. A variety of prey is consumed. In most studies from the Pacific Northwest, moths and flies dominate the diet, with beetles, caddisflies, neuropterans, termites, and bees/ants also sometimes eaten in significant amounts (Whitaker et al. 1977, 1981a, Henny et al. 1982, Wunder et al. 1992, Kellner and Harestad 2005, Lacki et al. 2007b, Ober and Hayes 2008a). However, caddisflies and to a lesser extent beetles were the primary foods in one study from British Columbia (Woodsworth 1981). Spiders are also sometimes consumed (Whitaker et al. 1977, Kellner and Harestad 2005). Foraging activity usually begins before dark (Brigham et al. 1997, Verts and Carraway 1998), although in western Oregon, Whitaker et al. (1977) detected almost no activity until after nightfall. Foraging is often greatest within a few hours of darkness, with additional peaks in activity sometimes noted during the rest of the night (Wunder et al. 1992, Verts and Carraway 1998). Foraging occurs over water, near the ground, within the forest canopy, along forest margins, and high above open ground (Fenton et al. 1980, Woodsworth 1981, Wilson and Ruff 1999). California myotis have rounded wing tips, low wing loading, and low aspect ratios, which give them slow maneuverable flight (Ober and Hayes 2008a). Their high frequency echolocation suggests that most insects are detected at close range (Ober and Hayes 2008a). Distances between capture sites and maternity roosts averaged 1,529 m (range = 500–3,140 m) in British Columbia (Brigham et al. 1997). Foraging is known to extend through winter in parts of western Washington (Falxa 2007a). Seasonal movements. No information is available. However, presence of numerous individuals in western Washington throughout the year (Falxa 2007a; G. Falxa, pers. comm. ; G. Green, pers. comm. ), sometimes in the same roost in multiple seasons, suggests that seasonal movements are limited or do not exist in some regions. The species has also been recorded year-round in Spokane County (N. Williams, pers. comm.). Threats. California myotis are probably negatively affected by some logging practices, particularly the removal of large-diameter trees and snags (WBWG 2005). High levels of pesticide residues were detected in this species for at least three years after aerial spraying of DDT to control larvae of the Douglas-fir tussock moth (Henny et al. 1982), although use of this chemical has since been discontinued. Roost sites may be lost through closure (i.e., blockage) of abandoned mines and from disturbance at caves by recreational cavers. Conservation measures. Retention and recruit- ment of large trees and snags during timber harvest is likely crucial to the conservation of California myotis in forested landscapes. On intensively man- aged forests, management agreements and incen- tives for protecting large-diameter roost trees and snags are desirable (Hayes 2003). Maintaining remnant patches of structurally diverse forest with abundant large snags is another protective strategy (Waldien et al. 2000). Where eviction from build- ings is necessary, non-lethal exclusion measures should be taken to minimize negative impacts on the bats. Precautions to reduce disturbance should be taken when mine and cave surveys are conducted during the breeding season and winter hibernation. Seasonal inventories of bat use should be conduct- ed at mines and caves considered for closure, with bat gates installed where occupancy is documented. Before pesticide spraying projects, surveys to iden- tify roosting and foraging habitat should be con- ducted to avoid spraying of important habitats.